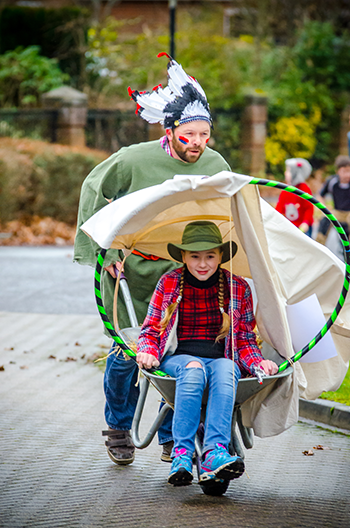 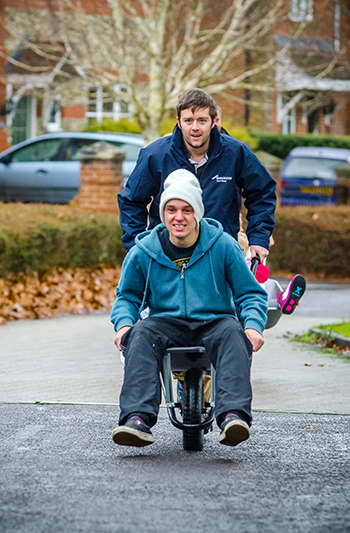 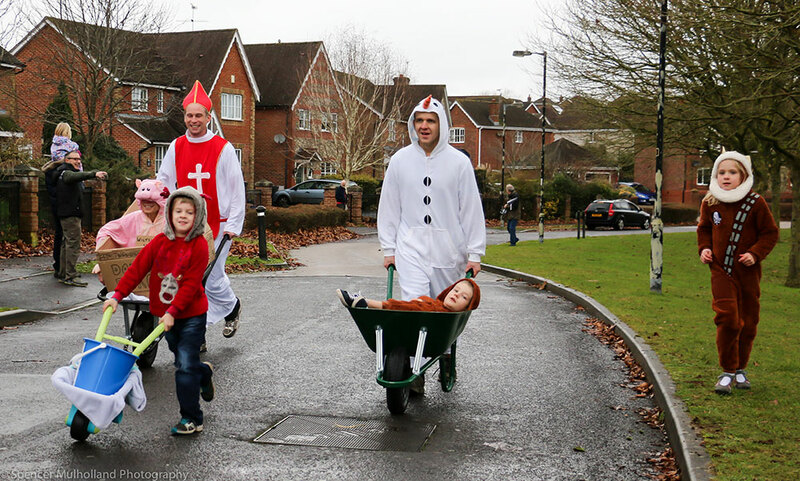 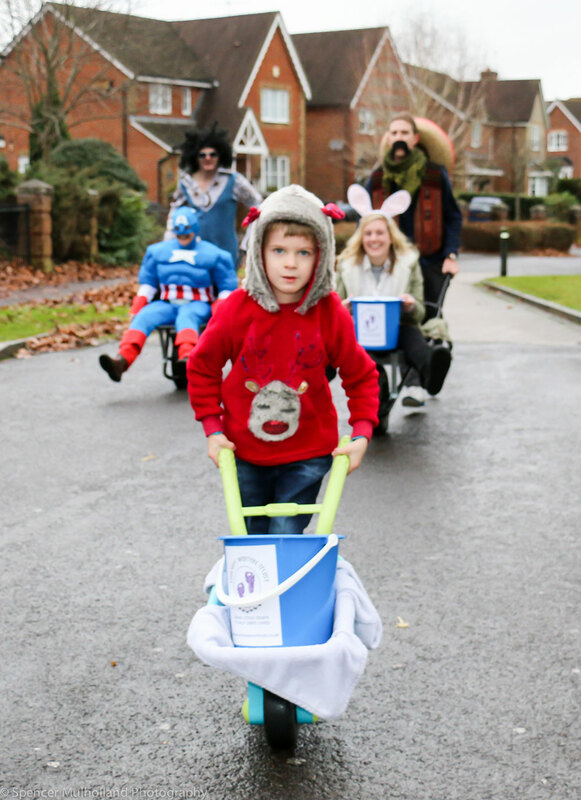 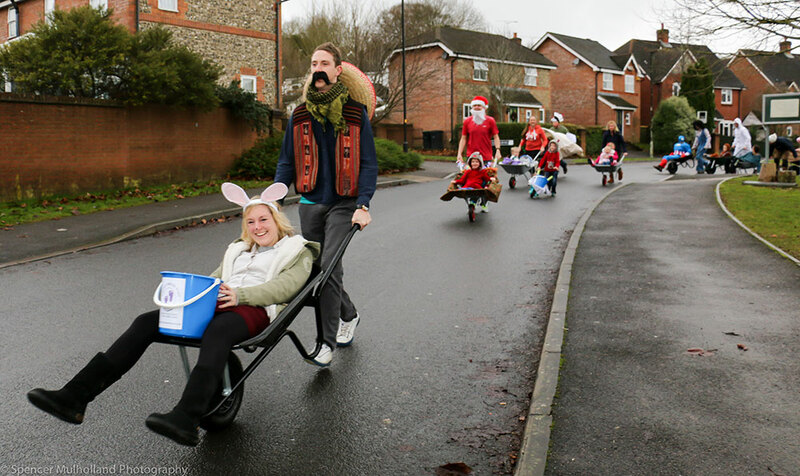 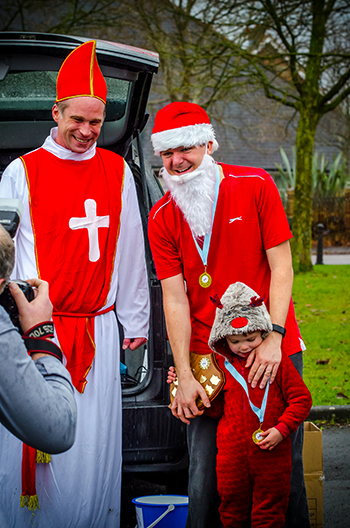 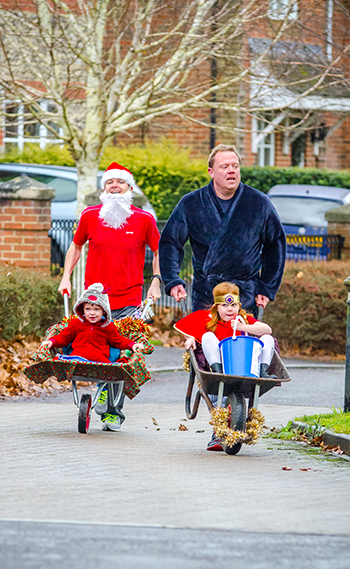 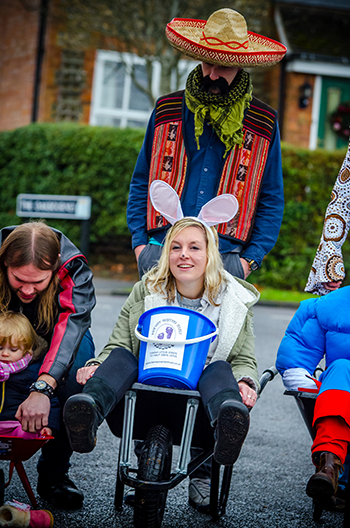 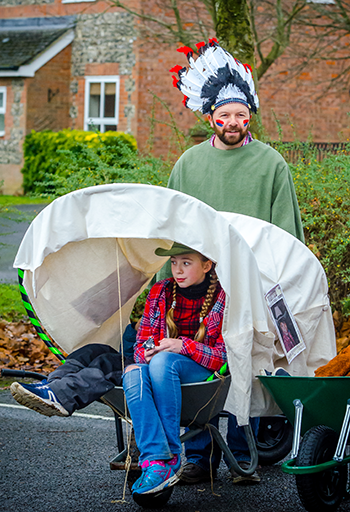 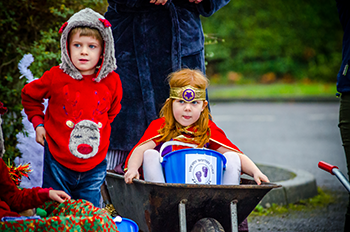 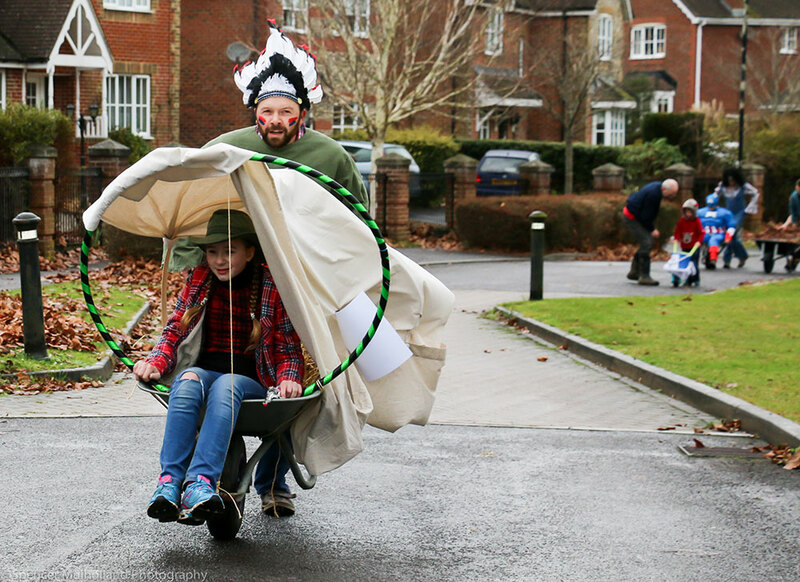 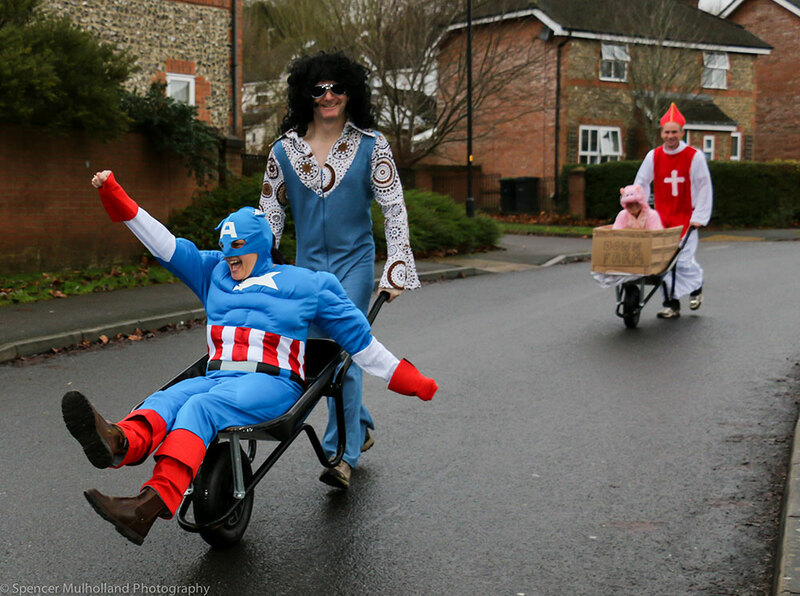 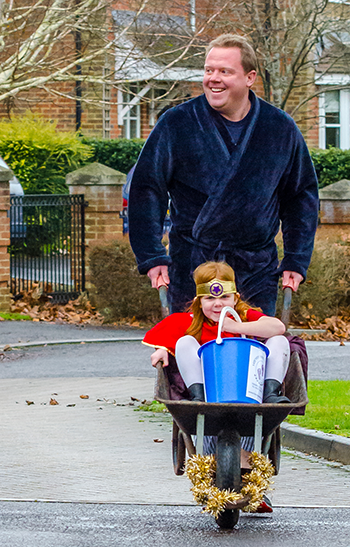 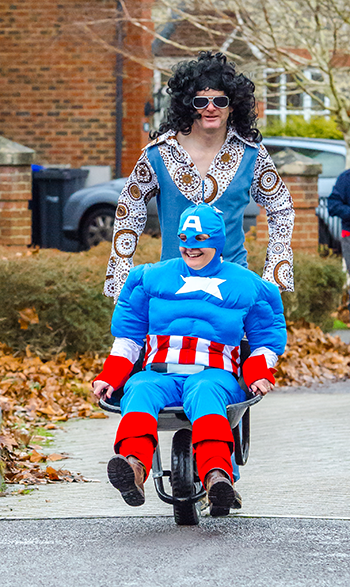 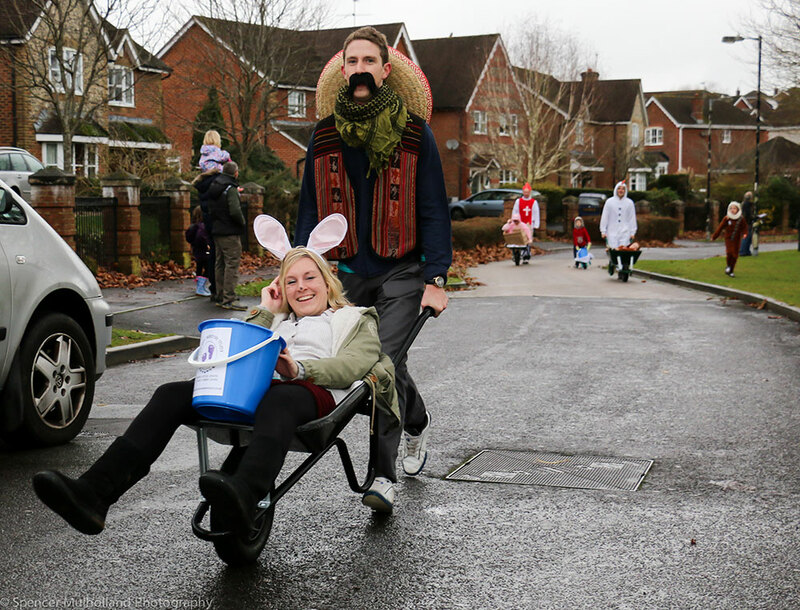 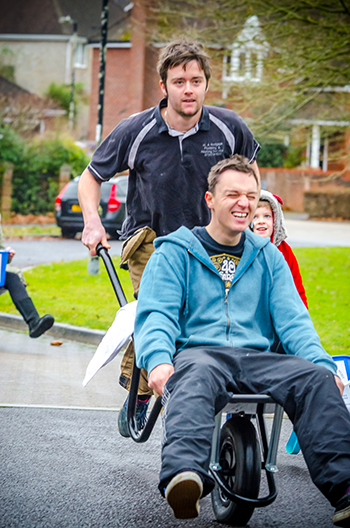 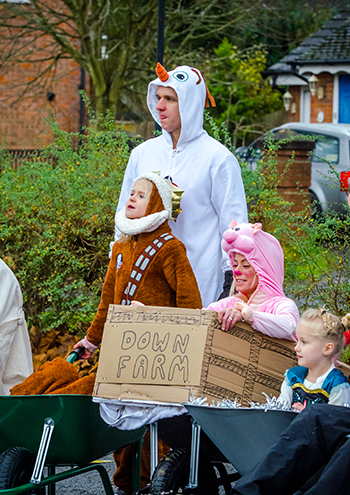 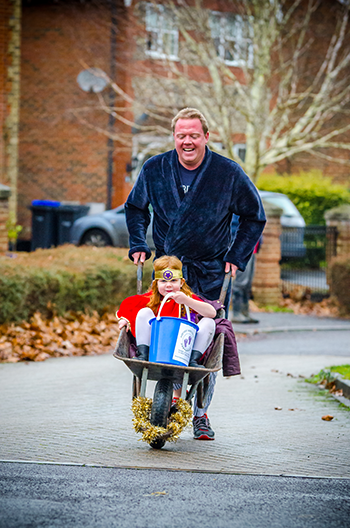 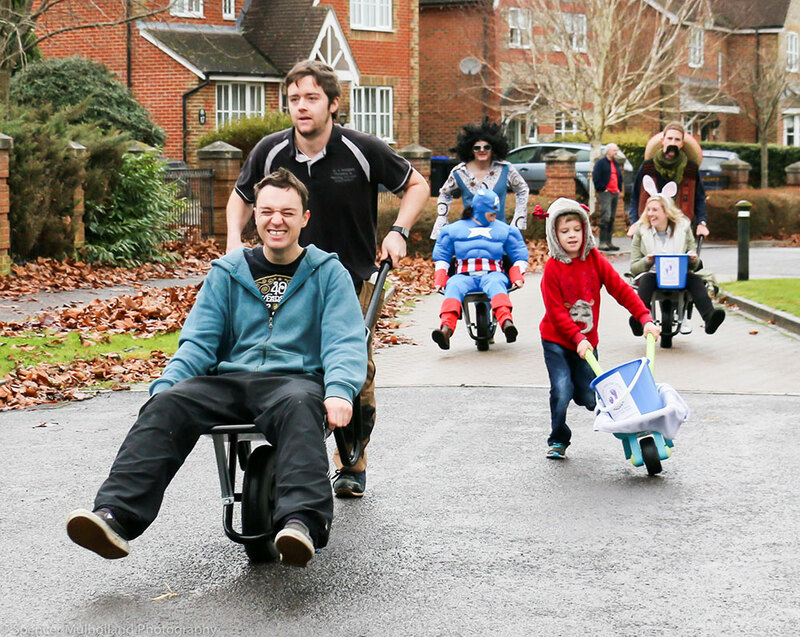 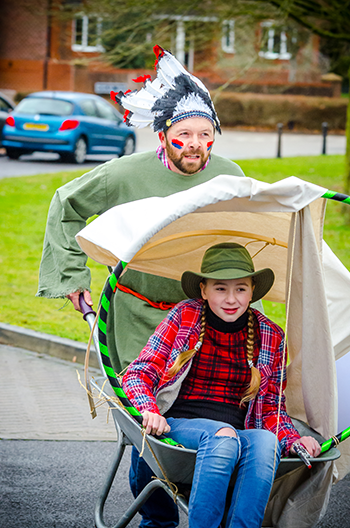 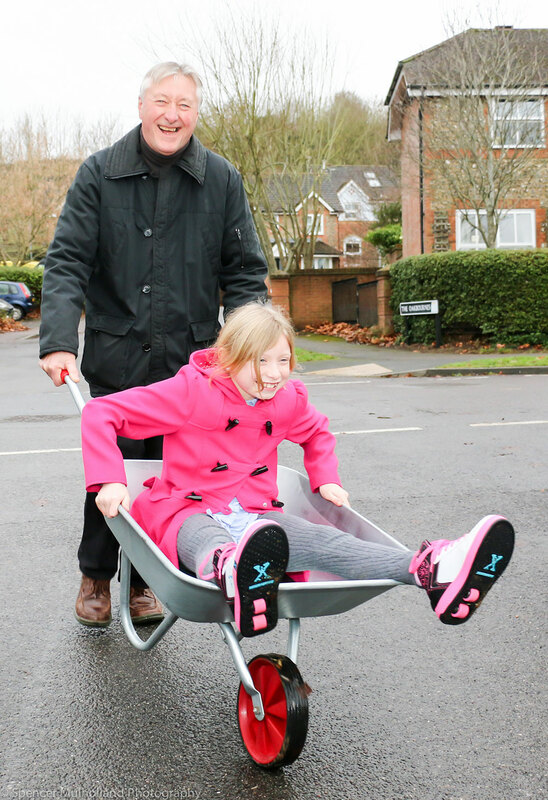 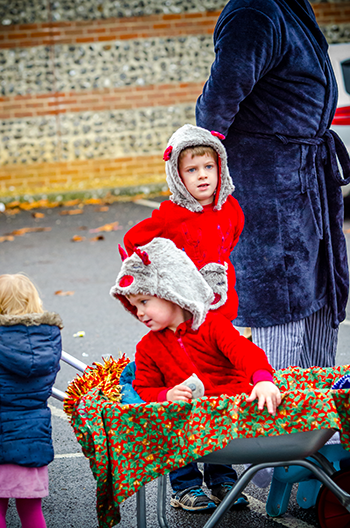 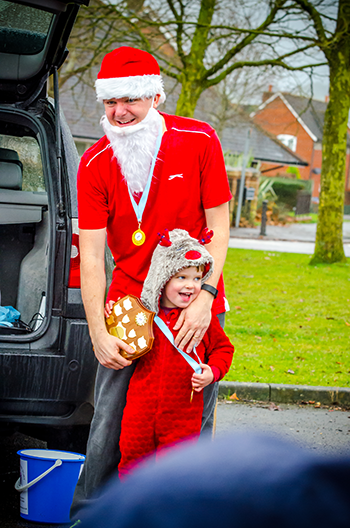 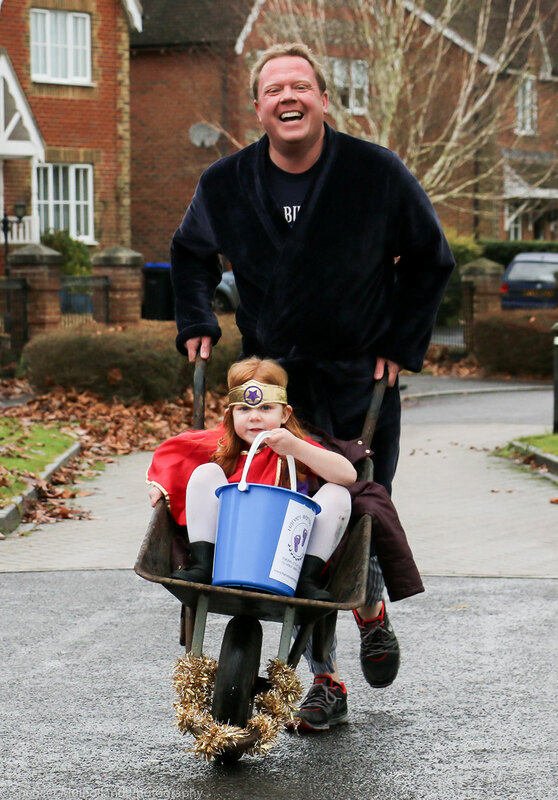 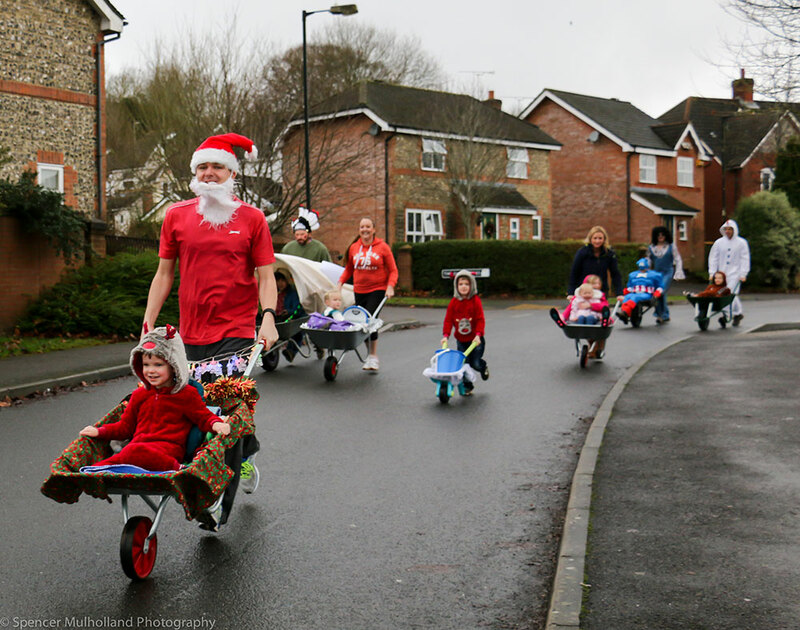 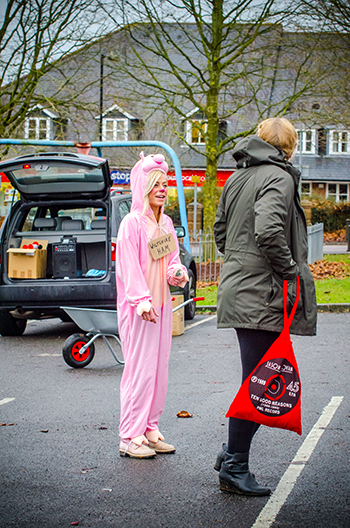 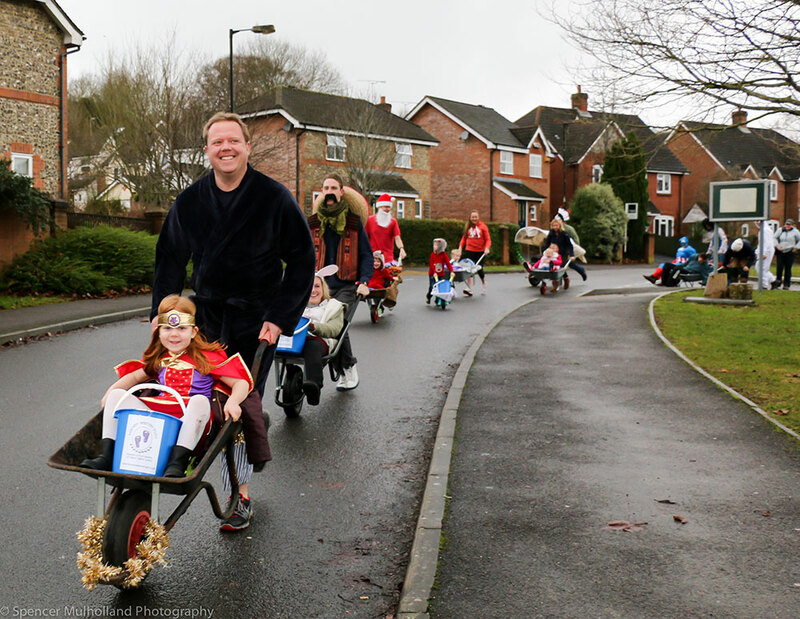 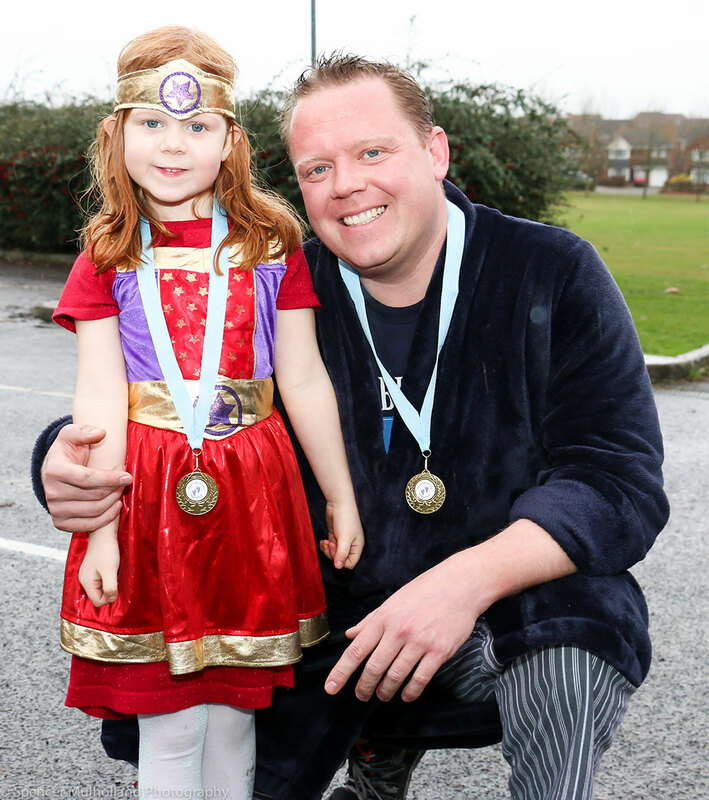 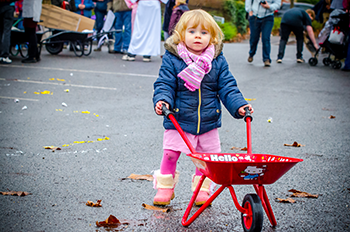 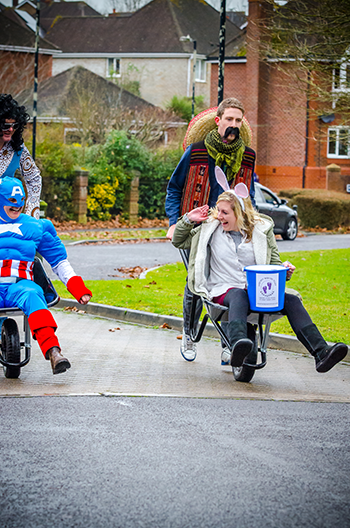 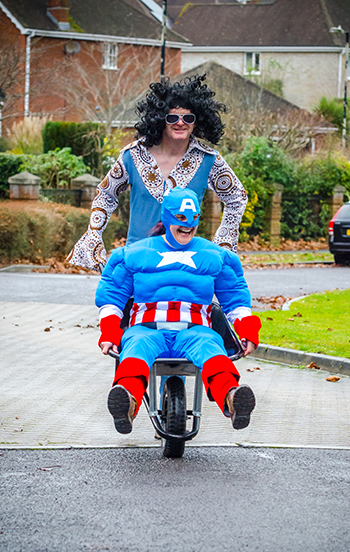 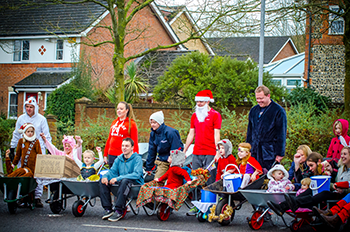 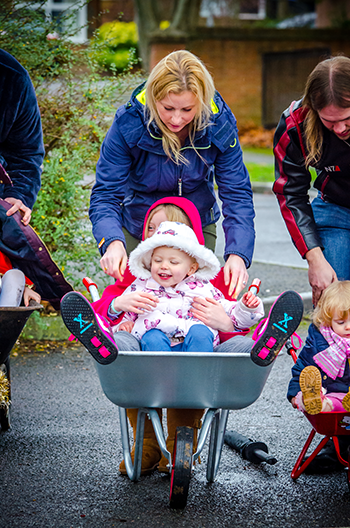 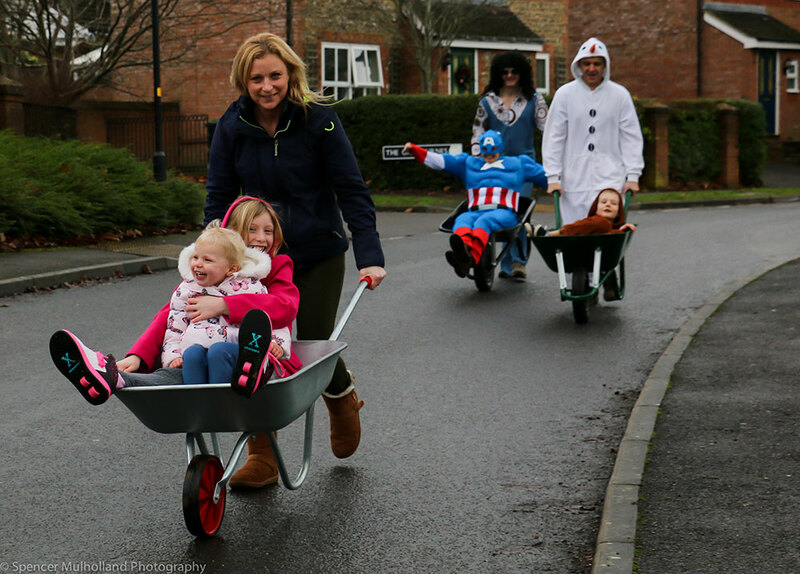 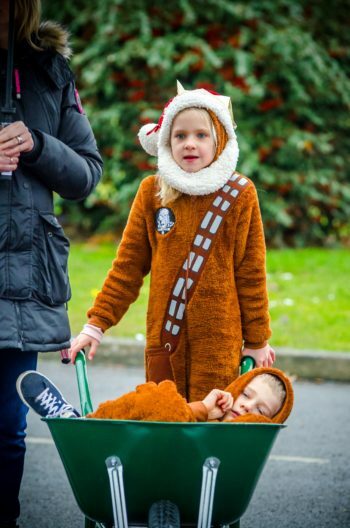 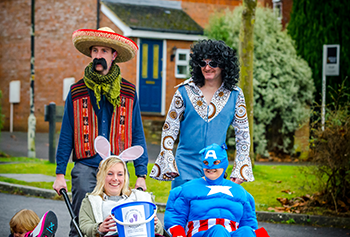 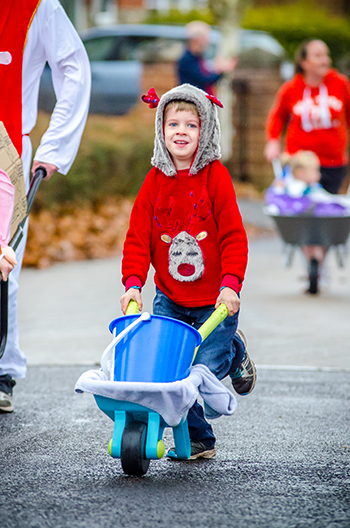 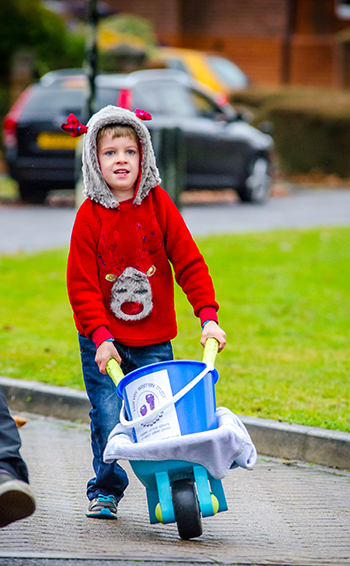 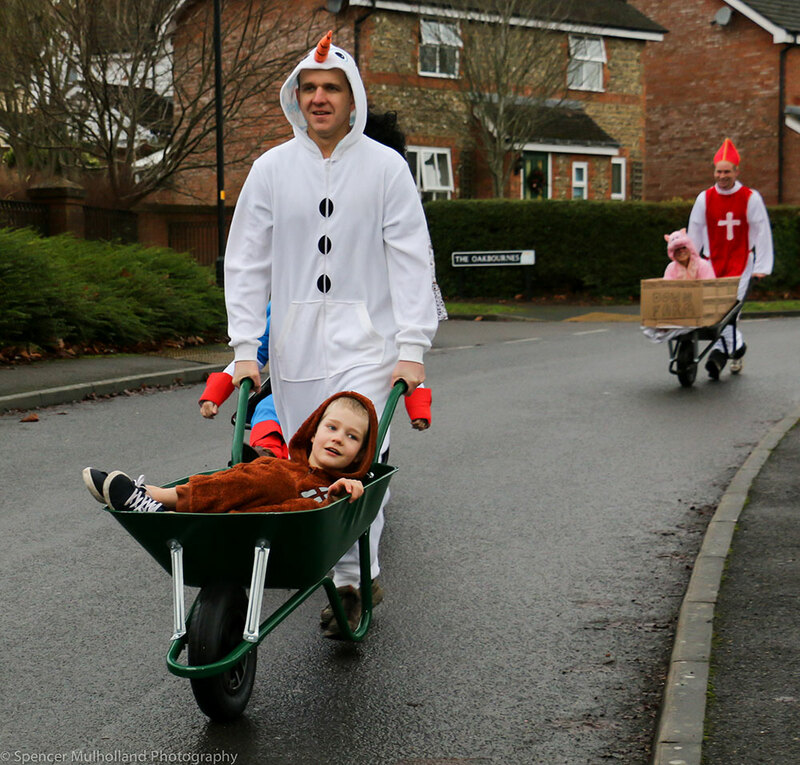 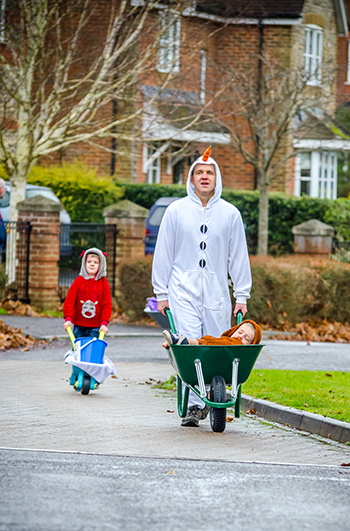 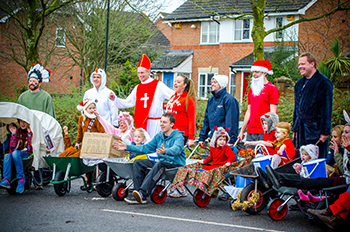 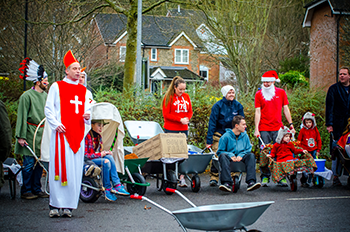 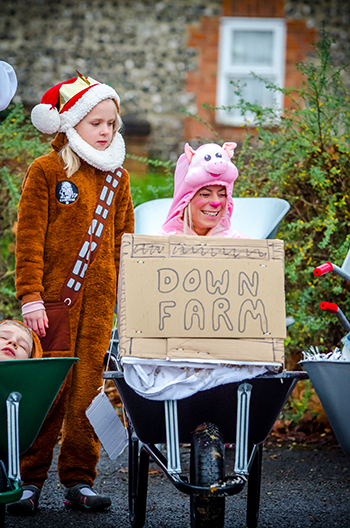 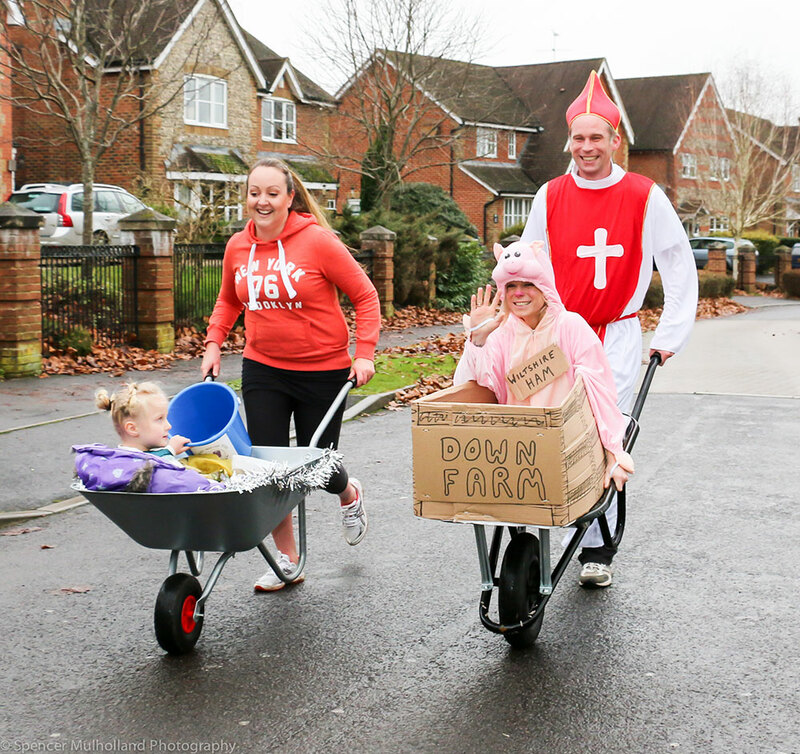 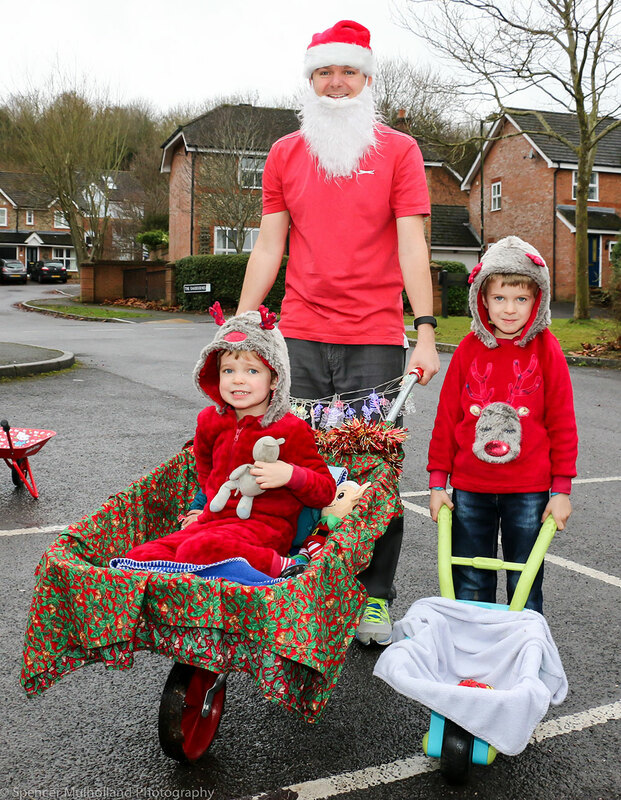 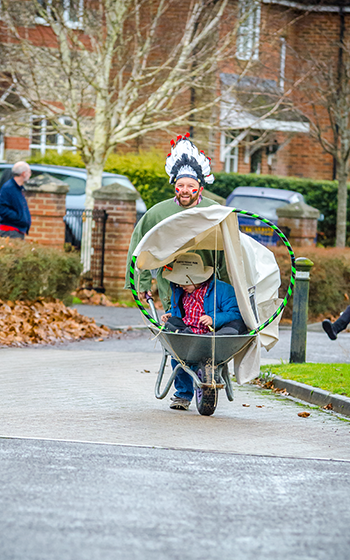 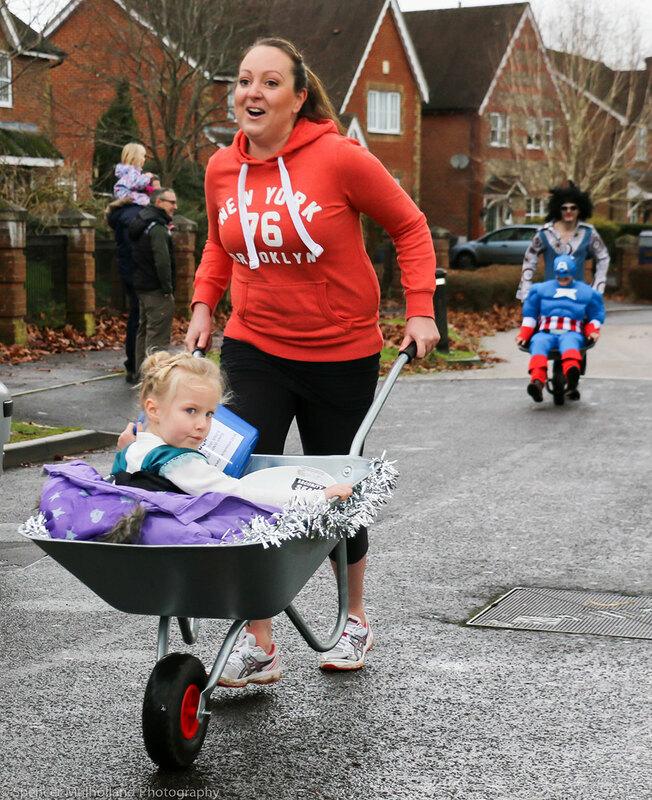 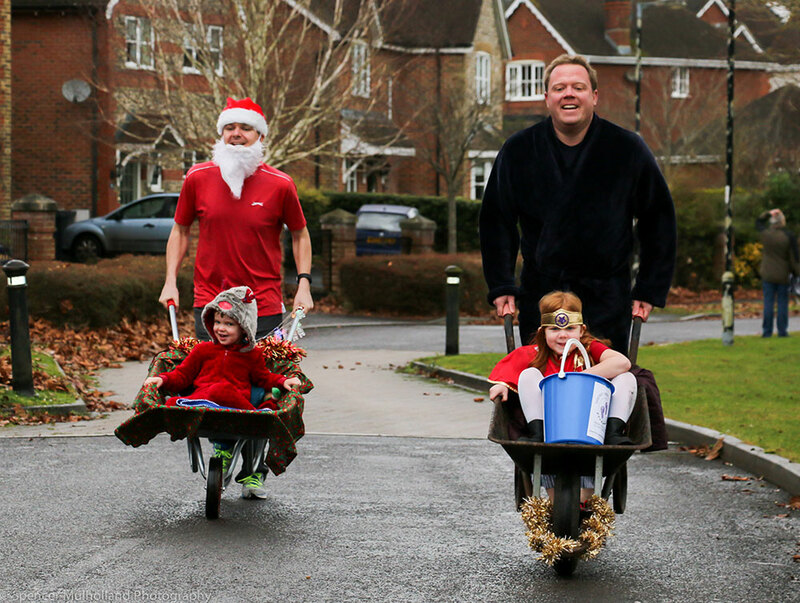 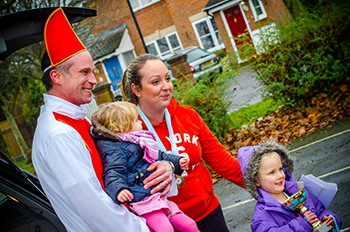 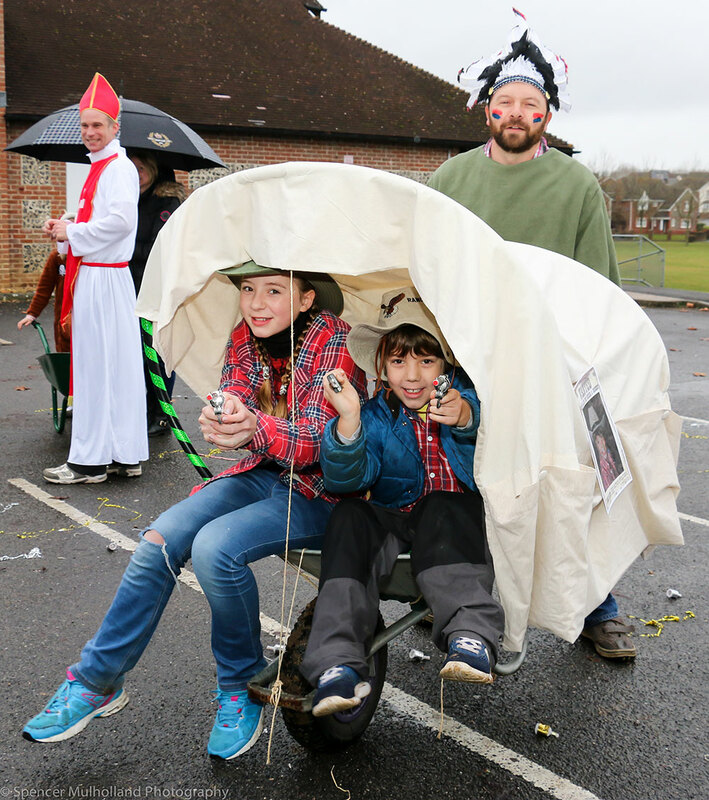 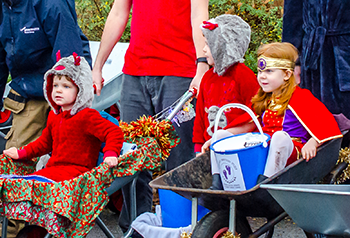 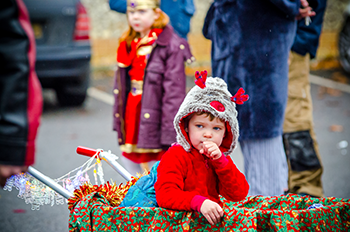 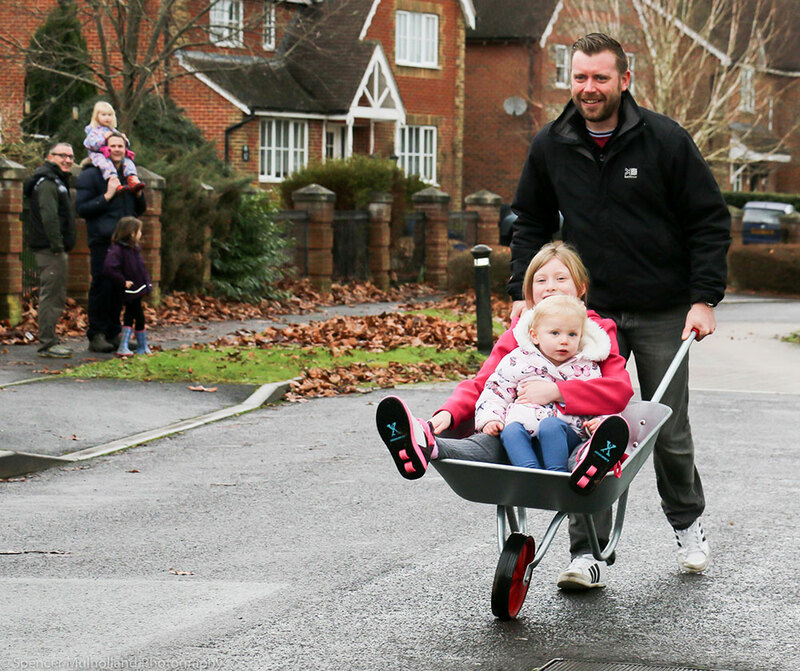 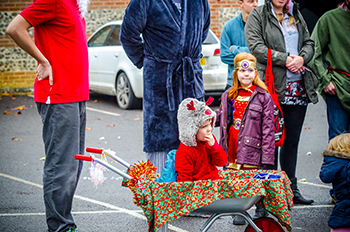 The fourth Harvey Warren Trust New Year’s Wheelbarrow race proved to be another great success with a wonderful number of contestants and a splendid cohort of supporters to cheer everyone along. 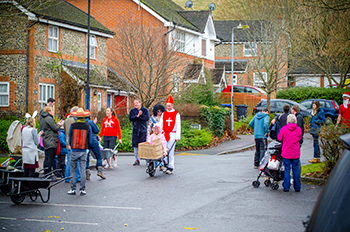 The racers assembled in their costumes with a modicum of decorum prior to the gun, then when the starting shot was fired, all were off with startling enthusiasm bearing in mind it was New Year ’s Day ! 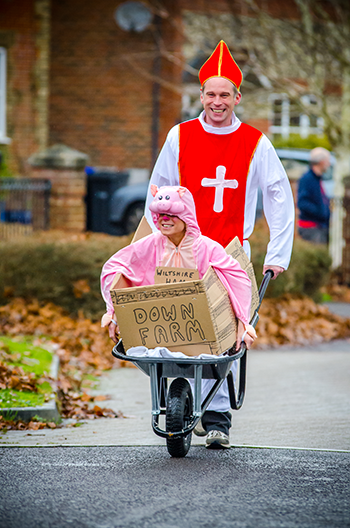 As the barrows raced down the first straight of the course, confidence was evident amongst all the pushers as this was the downhill part ! 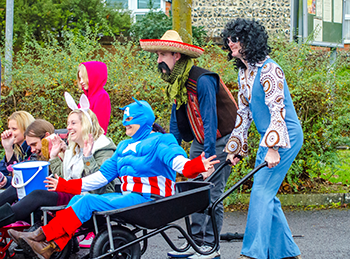 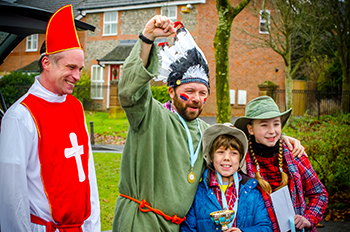 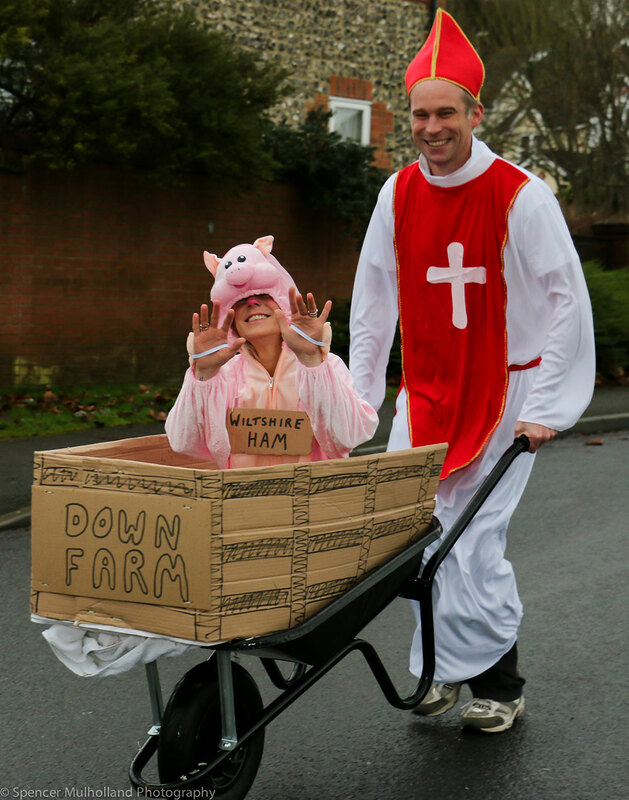 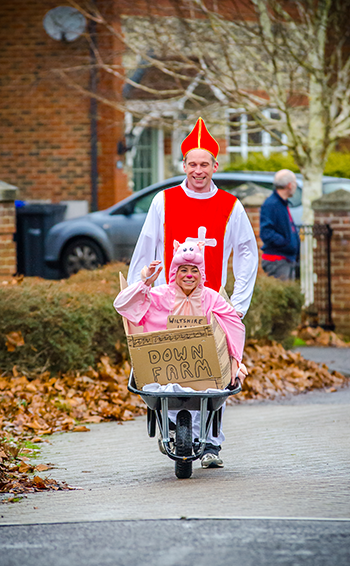 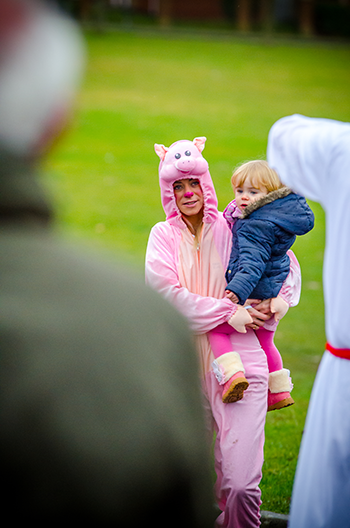 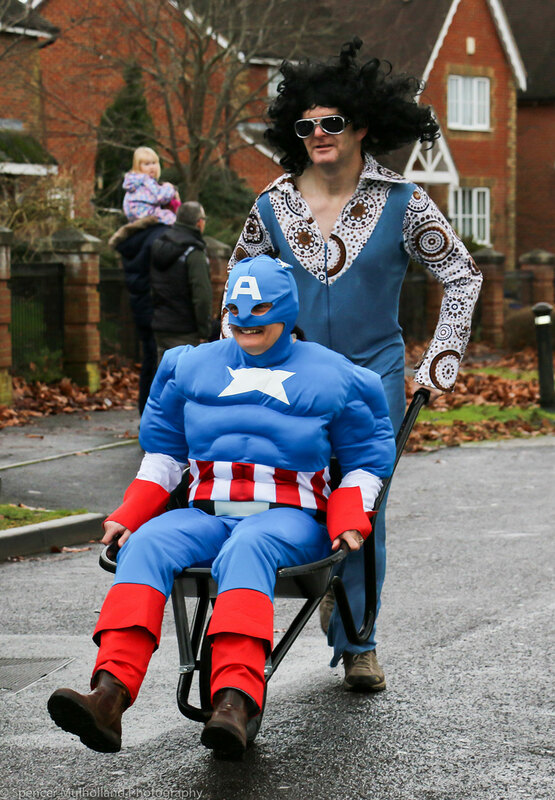 The fancy dress was tremendous including a bunny being pushed by a poncho, sombrero and gaucho moustache wearer; Captain America being pushed by a 70’s Scot, an Indian chief pushing cowboys in a wagon, a chicken, Father Christmas, a dressing gowned man, a Bishop, a pig and the list could go on. 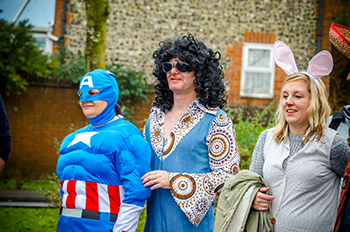 It was a great event, yet again and it was wonderful to see so many return this year and fantastic to have more and more people joining in. 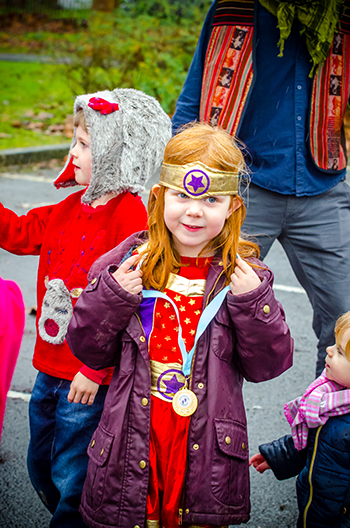 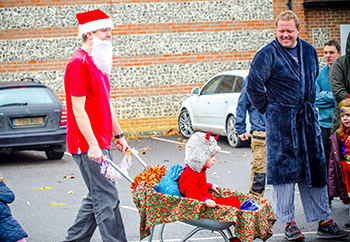 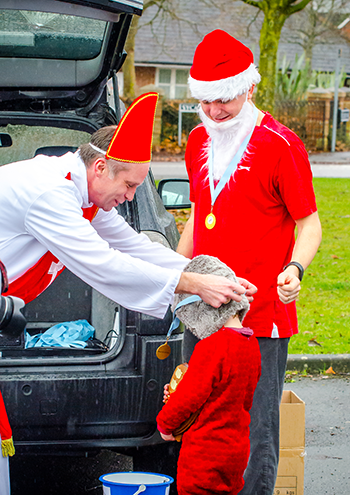 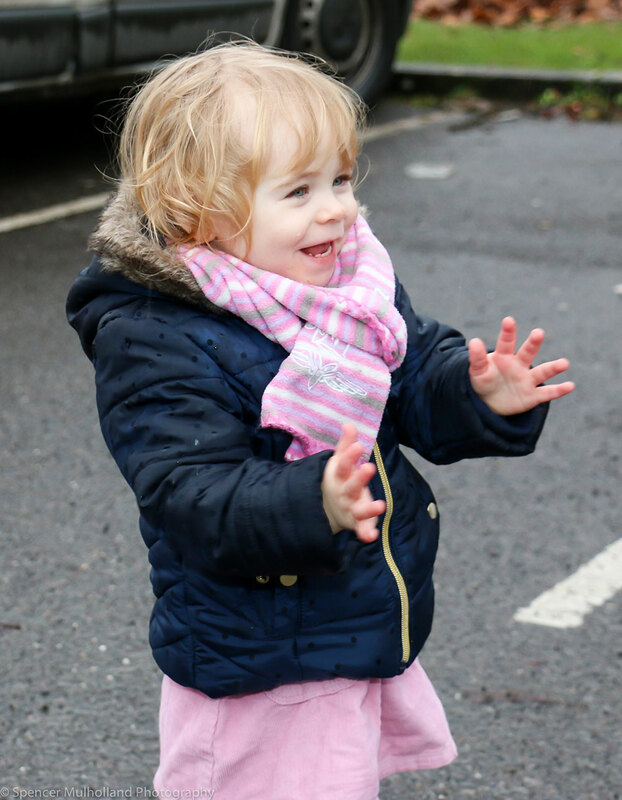 We served up chilli and Gluwein (+soft drinks and mild chilli for the little ones !) 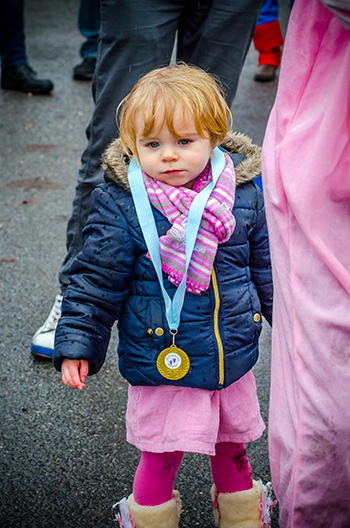 after the race and it was fabulous to have so many people join us and we hope you all enjoyed yourselves as much as we did. 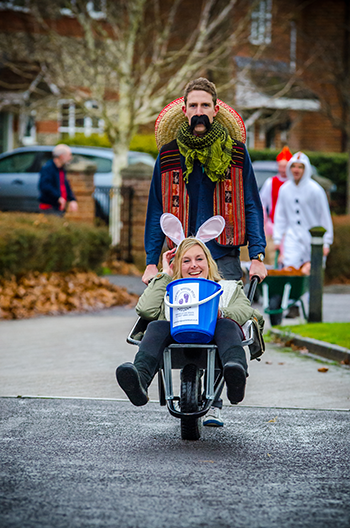 ‘Most sponsorship raised’ Jess and Suri Dunford. 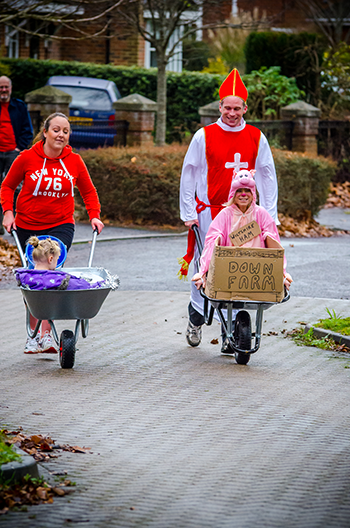 ‘Best fancy dress’ were Craig Somers with Sienna and Zack. 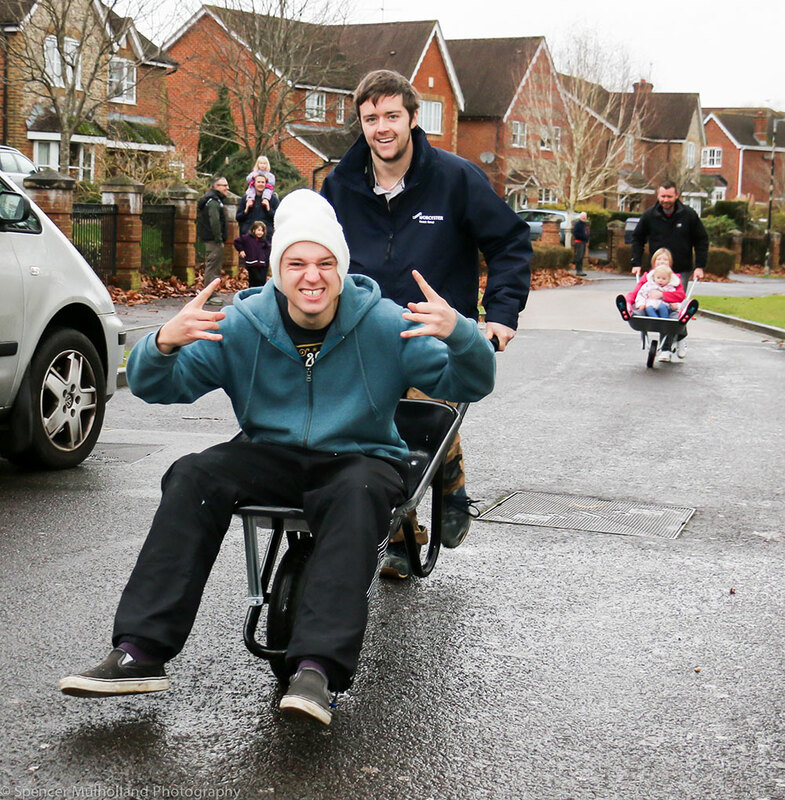 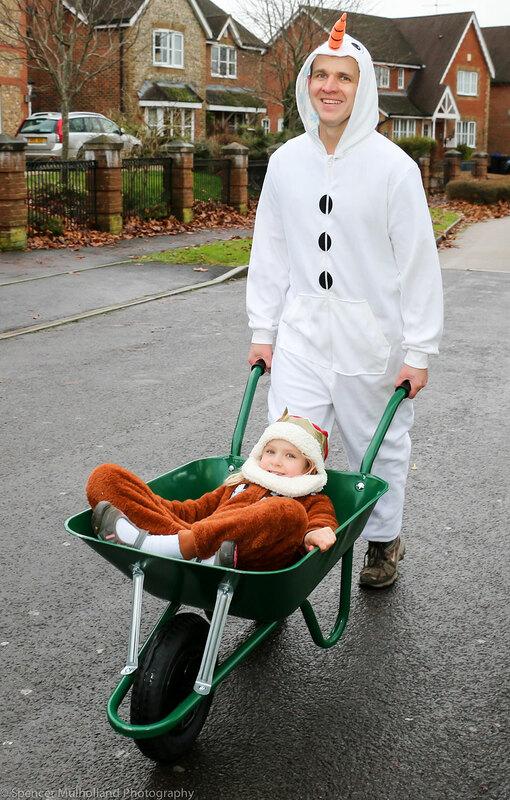 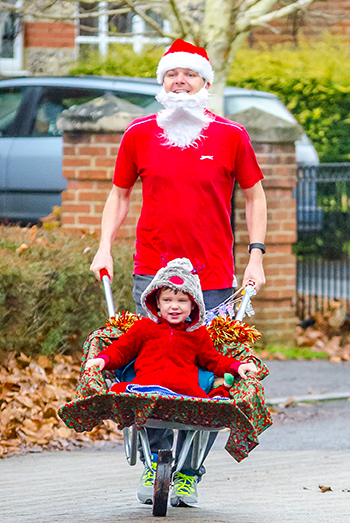 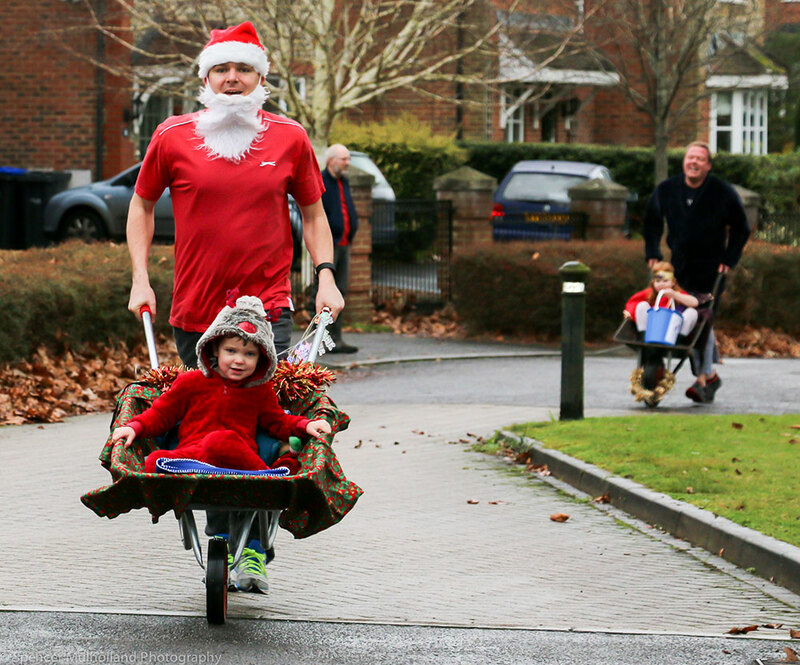 ‘Fastest wheelbarrow’ Mike O’Callaghan and son. 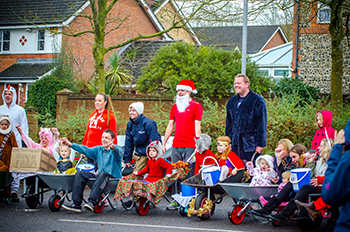 Very well done to you all and thank you so much for your efforts and taking part. 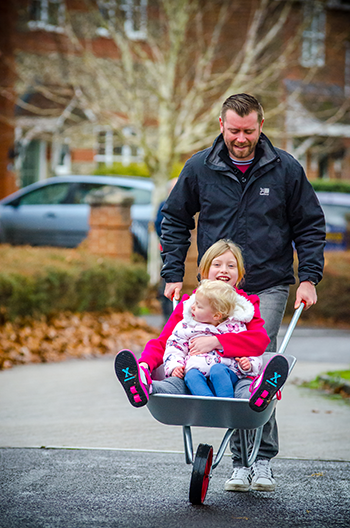 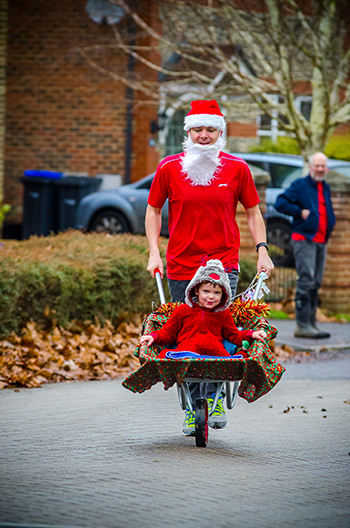 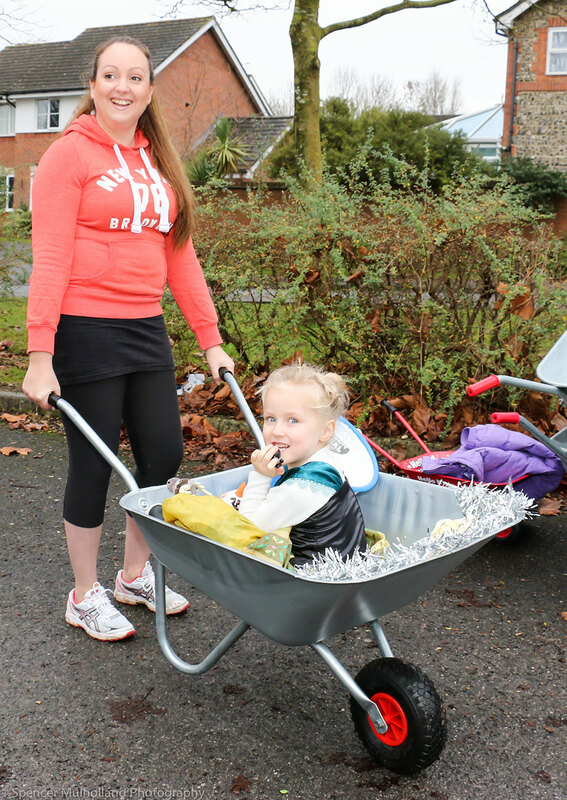 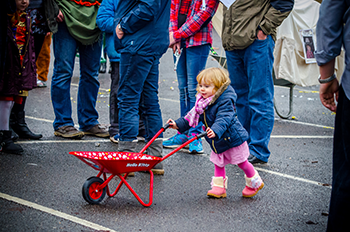 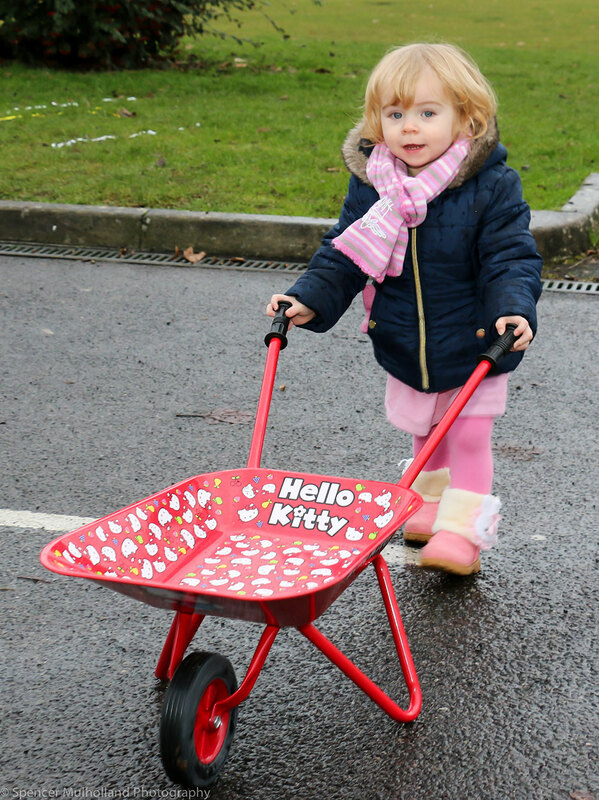 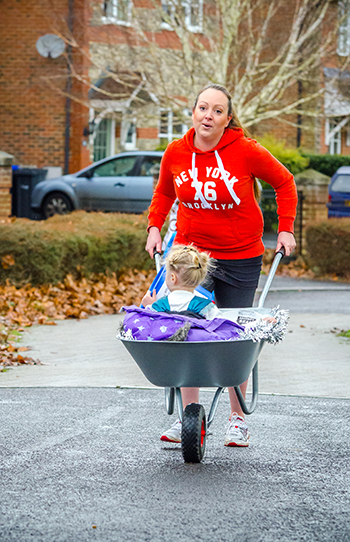 This year as in previous years, we are so grateful to Homebase for once again lending us the wheelbarrows as we could not hold the race without your support. 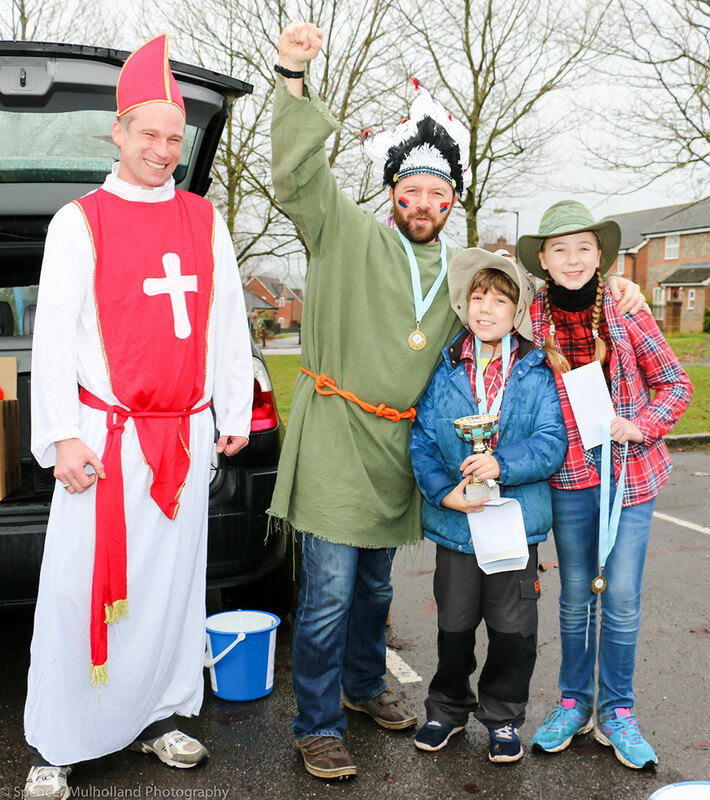 There was a lucky dip of days out and meals out and we must say a huge thank you to all those who donated these fabulous prizes. 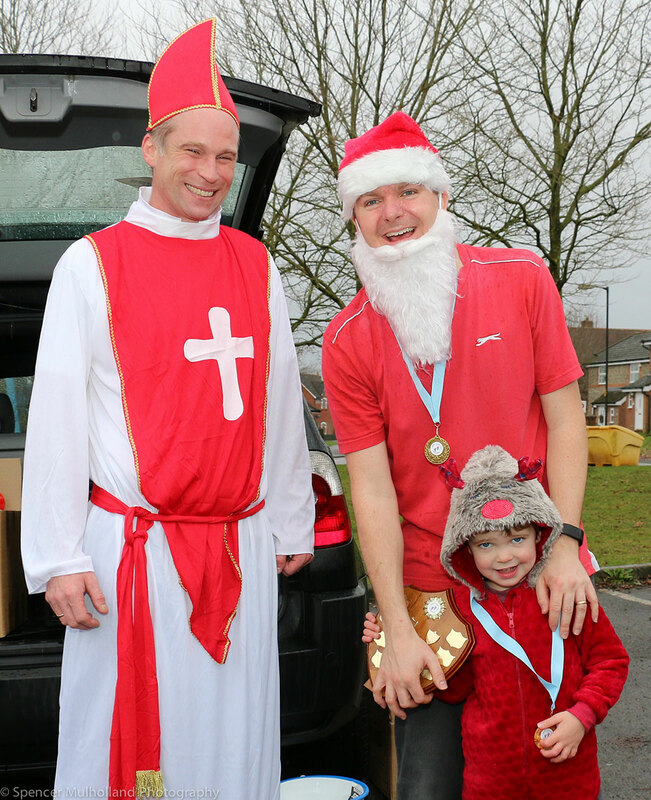 We are so grateful to for these very kind donations feel sure they were thoroughly enjoyed by our winners. 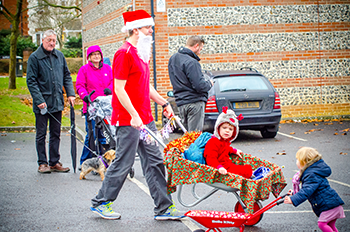 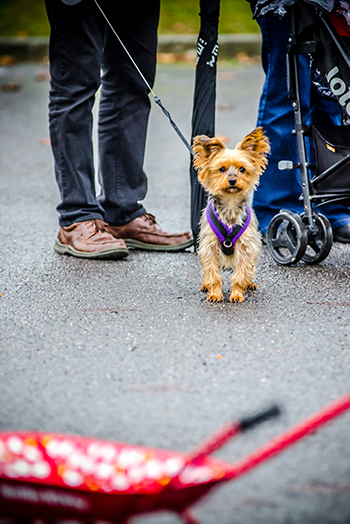 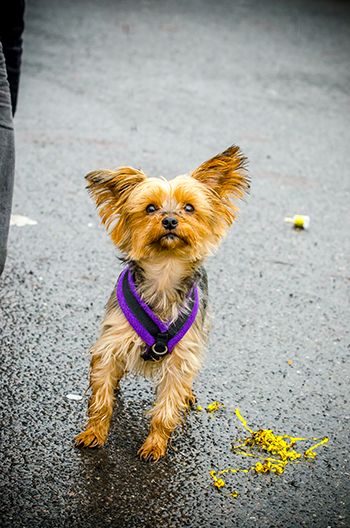 We are, as ever also delighted that the Salisbury Journal were able to come and take some fabulous photographs and cover the event before and after and thank everyone there very much. 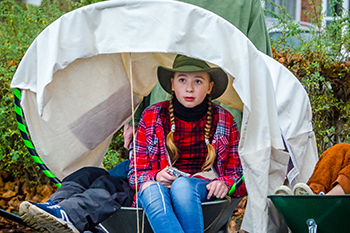 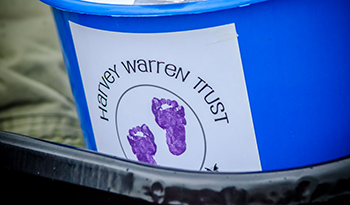 Harvey Warren Trust is only a small local charity but we are trying to do our best to help others and we are so grateful for all your support and look forward to seeing you all next year. 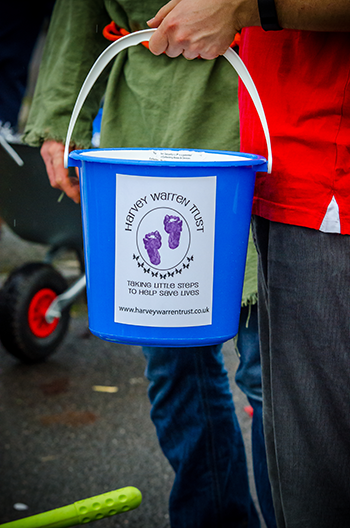 Please do spread the word and bring your friends.